If you are looking for a seven day cruise to experience amazing Mayan archaeological sites and the iconic Key West, the Holland America Western Caribbean cruise on the Ryndam out of port Tampa is one of the best Caribbean cruises we have found. From a well-designed ship that is neither too large nor too small to a very competent and friendly crew that exceeds expectations to some really great opportunities to experience ancient culture, this is an exceptional Caribbean vacation. The Holland America Ryndam holds 1,260 passengers and has a crew of 580. The décor throughout the ship features art and artifacts from the 17th, 18th and 19th centuries. The positive attitude of the Ryndam crew seemed to pass along to the passengers making this seven day cruise most enjoyable. This Holland America ship has implemented a new program for boarding and exiting the ship where passengers arrive and are signed in and in their cabin within less than an hour. In our case, it was only 35 minutes from the time we entered the port until we were relaxing in our cabin! Our first port of call was Key West. This Florida town is home to the southernmost point of the USA and has long been a favorite of writers, artists, musicians and politicians. Some of Hemingway's and Tennessee Ernie Williams' most famous works were penned here. There are numerous popular excursions offered. The City View Hop On Hop Off Bus is a 60 minute tour highlighting the history of Key West. The Truman’s Little White House And Train Trolley Tour is a fully narrated one hour tour of Key West and the Little White House which was built in 1890 and home to many distinguished guests (a tour of the Hemingway House can also be added.) The Old time Trolley/Conch Train gives you a fully narrated one hour tour covering over 100 points of interest in an open air trolley. Key West is filled with live-music bars and historic restaurants in addition to the ever-present and colorful souvenir shops. Be sure to grab a piece of Key Lime Pie sometime during your adventures. If you are really feeling adventurous, have a drink at The Garden of Eden, a rooftop, clothing-optional bar on top of the Bull and Whistle at the corner of Duval and Caroline! We chose the Fury Glass Bottom Boat Tour which included a 30 minute cruise to the large reef where guides highlighted the undersea world clearly viewable from two rows of underwater windows fitted into the ships hull. The vessel offered both a sundeck and air conditioned seating. Snacks and beverages are available onboard. It was a relaxing, informative and enjoyable tour. Visit http://www.furycat.com for more information. Mallory Square is a favorite gathering spot for local musicians, street performers and food vendors in celebration of each sunset. We were able to view the performers from the promenade and lido decks of the ship. This was definitely and added and unexpected bonus to our sailaway celebration. Belize City, Belize, our next port, is the largest city in the Central American nation of Belize with a population of nearly 80,000. It was the capital of British Honduras until 1970 and is known for hundreds of ancient Mayan sites, the longest barrier reef in this hemisphere and a lush tropical rainforest. There are several interesting excursions offered. The Mayan Ruins of Xunantunich takes you to a major Mayan ceremonial center with the El Castilla partially restored Mayan Temple just two miles from Guatamala. The Caves And Jungles of Belize Tour is a high speed boat ride on the Sebun River to a secluded farm, a rainforest walk, and a cave experience followed by a swim in the cool river. The Lost Mayan World Indiana Jones Adventure includes a hike up a hillside trail through the jungle seeking the “Dragon’s Mouth” ceremonial entry into the Mayan underworld to “experience only what you see in movies.” This tour offers a hike through different levels of the Mayan Underworld, zip lines, swinging suspension bridges and rapeling down a cliff face! Our third port of call was Roatan, Honduras. Honduras is the second largest central America nation but is the least populated. The lush rain forest is filled with both rivers and volcanoes. Most of the country is undeveloped and it is often called one of the most beautiful places in the Americas . Excursions include the Dolphin Encounter at the Institute of Marine Sciences where you can get to know dolphins in their natural habitat and includes a briefing followed by actual interaction and touching of dolphins in waist deep water. The West Side Island Tour And Carambola Botanical Gardens features a variety of hummingbirds and tropical plants and an opportunity to enjoy the West End Village. We chose to enjoy the day at the free beach just a five minute walk from the ship. If you would rather not walk, a ski lift will take you from the cruise center to Mahogany Bay Beach for about $12 for an all-day pass. The beach features hundreds of free lounge chairs, emerald green waters, rest rooms, changing rooms and several beachside bars and snack areas. Snorkeling equipment is available to rent. Mahogany Bay port also has many different shops for your shopping pleasure including a large craft market. Our last port of call was Costa Maya, Mexico. Costa Maya, along the southern Mexico coast, stretches down to the Belize border. The port is a very modern facility filled with brightly colored shops, restaurants and bars complete with a faux beach and swimming pool. The Costa Maya area is mostly undeveloped but contains multiple Mayan ruin sites. Multiple excursions in Costa Maya are offered including the Bio Maya Canapy Tour which is a can0py zip line adventure at Bacalar Lagoon. There are three zip lines varying from 165 to 825 yards in length. 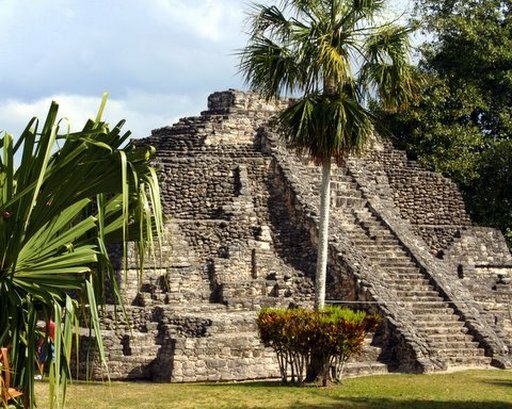 The Kohunlich Mayan Ruin is a two hour drive to a Mayan site which houses several plazas, a ball court and the Temple of the Mask. Lunch at a lakeside restaurant is included. The Mayan Culture Experience is a visit to a local town whose inhabitants are direct descendants to the same Mayans who built the ruins. Meet a traditional Mayan family, visit their home and learn of the challenges they face in daily life. Our last cruise day of our seven day cruise was at sea giving everyone a chance to relax and enjoy the pleasures of the Ryndam. Exiting the ship was another pleasant surprise. The newly implemented program was so well organized we left at our cabin at our designated time, got our luggage from the terminal luggage area and were at the curb waiting for our transportation within 30 minutes! Compared to other disembarking experiences on other lines, the Holland America Ryndam was embark and disembark experience was fantastic! If you are looking for a seven day cruise to experience amazing Mayan archaeological sites and the iconic Key West, the Holland America Western Caribbean cruise on the Ryndam out of port Tampa is one of the best Caribbean cruises we have found.